Gas Purifiers and Filters are supplied in two designs, In-line and Base Plate. CRS ZPure Glass In-line Gas Purifiers are convenient point-of-use purifiers with high sensitivity visual indicators for oxygen and water breakthrough. They are available with compression or quick connect fittings in brass and S/S. The glass body is shielded by an outer polycarbonate protective body. CRS ZPure Metal In-line Gas Purifiers are high-efficiency traps with outstanding capacity. High quality activated adsorbents ensure long purifier life and efficient contaminant removal. Available in 4 sizes of stainless steel cylinders and with a wide range of compression, quick-connect and push-to-connect fittings. 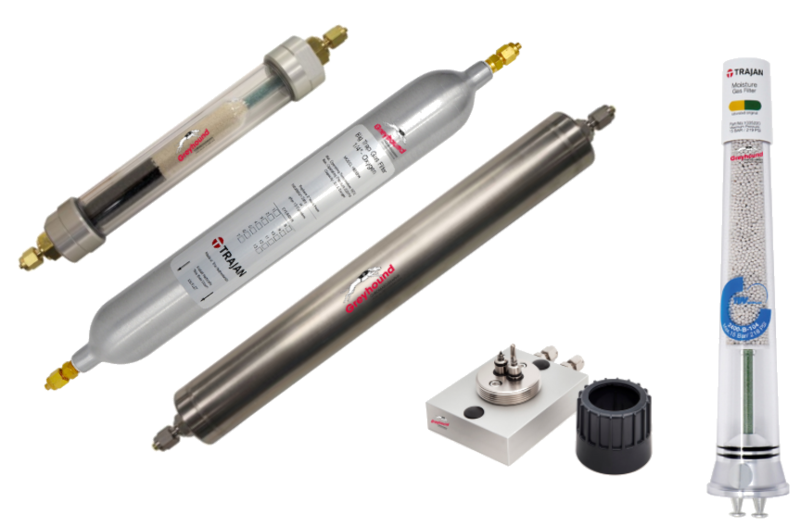 Trajan Big Trap In-Line Gas Purifiers are designed for bulk purification applications or where several instruments are plumbed from a single source. Manufactured from one-piece heavy walled aluminium tube with a 750cm3 capacity.